It’s no secret that one of the top conditions that compels people to take their pets to the veterinarian is itchy skin and the allergies that can cause it. Thankfully, treatment options for atopic dermatitis (AD) have improved greatly in recent years, and other solutions appear to be on the way. Several factors contribute to the difficulty of managing canine and feline atopic dermatitis, said Ashley Bourgeois, DVM, Dipl. ACVD, of Animal Dermatology Clinic in Tustin, Calif.
“One of the biggest issues is recurring secondary pyodermas developing resistance to several antibiotics,” Dr. Bourgeois said. “Specifically, methicillin- resistant Staphylococcus pseudintermedius [MRSP] is becoming a more prevalent organism and a common complicating issue for allergic patients. Denise Petryk, DVM, a staff veterinarian with pet health insurer Trupanion in Seattle, said managing atopic dermatitis in 2016 will continue to be much easier than it ever has been. “There are many more dermatologists that pet owners have access to, there are steadily more hypoallergenic diets available, and people now are enrolling their dog or cat with pet insurance to cover the expenses for the specialized treatments,” Dr. Petryk said. “Atopy is a very common diagnosis, so it always is best to ask your veterinarian this question, but there are a number of advanced prescription diets as well as specific desensitization allergy treatments that are available,” she said. Some refractory atopic dermatitis cases will not respond to mild symptomatic therapy. “Every patient presenting for atopic dermatitis management is unique. There is no one correct solution for all patients,” Bourgeois said. “Ideally, allergy testing followed by appropriate immunotherapy is still the hallmark treatment for atopic dermatitis. Luckily, veterinary pharmaceutical companies have been developing more medications with differing mechanisms to create alternative treatments. One of the most promising is Apoquel, a Zoetis Inc. product that has been out for a couple of years. It is FDA- approved for the management of pruritus in dogs with allergic dermatoses and for the chronic management of dogs with atopic dermatitis. As with other symptomatic therapies, it is prescribed as part of a larger treatment plan. “This medication acts very quickly, which is a major benefit. However, similar to other anti-allergic drugs, there are some cases that do not respond to Apoquel,” she noted. “It is critical to make sure that the secondary complications of allergic skin disease are adequately managed. Lauren Pinchbeck, DVM, MS, Dipl. 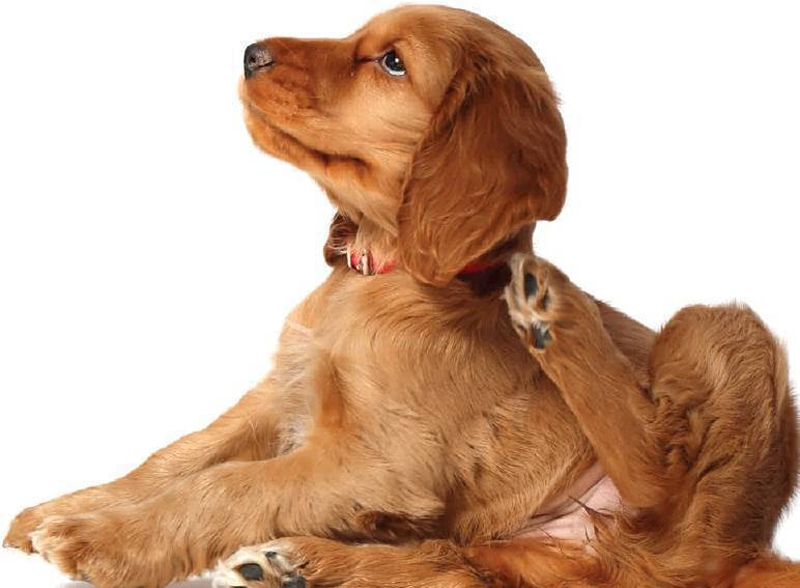 AVCV, of Northeast Veterinary Dermatology Specialists in New York and Connecticut, noted the availability of symptomatic therapies for managing pruritus that is associated with atopic dermatitis. For example, Elanco Animal Health’s Atopica (modified cyclosporine) remains an effective medication that is FDA- approved and which Dr. Pinchbeck uses as a sole intervention or as part of a treatment plan. She also likes Apoquel, because it allows her to gain control of pruritus quickly, provide relief to the patient and put other aspects of the management plan in place. The newest intervention she uses is Zoetis’ Canine Atopic Dermatitis Immunotherapeutic, a biologic with conditional license approval and in limited release. Still, Pinchbeck added, though new, remarkable tools exist for managing symptoms of atopic dermatitis, allergen specific immunotherapy (ASIT) continues to be the only intervention that treats atopic dermatitis. Mark Heffernan, CEO of veterinary drug developer Nexvet Biopharma, said the company is exploring NV-08, a treatment for canine inflammatory diseases such as atopic dermatitis. Some of the newer solutions might seem too expensive for the average pet owner, but acceptable substitutes may be available. For example, immunotherapy may be cost-effective in the long-run, because of the infrequency of administration and the lack of long-term monitoring that has to be performed. However, allergy testing can be more expensive upfront, and some clients can’t afford this. “The least expensive option for managing atopic dermatitis for most patients is corticosteroids,” Bourgeois said. “However, chronic side effects, such as liver damage, kidney issues, diabetes mellitus, are accepted when using these long term. If the dose can be kept in the anti-inflammatory range and appropriate lab work performed every six to 12 months, then many patients can tolerate the use of corticosteroids. Trupanion’s Petryk pointed out some Band-Aid approaches to helping an atopic dog. While antihistamines, bathing and corticosteroids can help with control, a more thorough approach often is best when it comes to keeping pets comfortable. Like any chronic condition, patients with atopic dermatitis require lifelong multimodal treatment and treatment modification, and education of the pet owner about the disease is critical to successful management. “Follow-up care is essential, as communication regarding patient response to therapy may lead to a change of course,” said Pinchbeck, with Northeast Veterinary Dermatology Specialists. “Veterinary dermatologists are equipped with that knowledge, and can be a valuable asset to the pet owner and support for the primary veterinarian. The earlier that pets are diagnosed with atopic dermatitis, the better chances of long-term success for the animal and less frustration for the owner. Identifying secondary pyoderma is essential to successful treatment of atopic dermatitis, as well as minimizing the risk of developing antimicrobial resistance. Drug makers constantly are researching and producing new therapeutic drugs for the management of atopic dermatitis. Bourgeois expects a few more medications to be released over the next couple of years that will help combat more difficult cases.